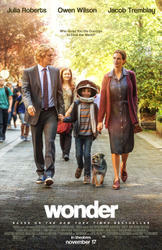 Wonder: Movie Clip - Why Are We Whispering? Two things you didn't know about the cast and creators of 'Wonder.' Featuring Izabela Vidovic, Owen Wilson, Julia Roberts, Jacob Tremblay, Daveed Diggs, Stephen Chbosky, and R.J. Palacio. Looking for movie tickets? Enter your location to see which movie theaters are playing Wonder near you.